I dropped Charlotte on her head last week. No joke. Okay so I didn’t actually drop her, she fell, but it was definitely my fault. We were in the Walmart parking lot. I had her all dressed up in this cute outfit (you know your life is boring when the biggest events of your week are Walmart and church) but she had a massive explosion on the way there, and of course I had forgotten to pack extra clothes. So I took her out of her car seat and stripped her down, using every single wipe I had. She was sitting up on the seat in nothing but a diaper (not the car seat, the window seat, with the door open). I was standing right there so I thought there was no way she could fall. I bent down to gather up her clothes that I had thrown on the ground…and looked up just in time to see her fall directly on her head. The weird part is that she only cried for about 30 seconds. I’m pretty sure that if I fell on my head I would cry longer than that. I called my brother, who’s an ER doctor, and he said if she’s acting normal then there’s nothing to worry about. Great. Now all I have to worry about is what kind of mother I am. I’m sure everyone else in Walmart was having that exact thought as I carted my baby through the store in nothing but a diaper, avoiding eye contact. Why do they always put the baby clothes all the way in the back? I was a little comforted when a lady walked by and, seeing me as I dressed my naked baby in clothes with the tags still on them that I had just taken off the rack, said, Yep, been there before. Even if you are now questioning my mothering skills, do not question my crock pot skills. I am so good at throwing stuff in a pot and letting it sit. 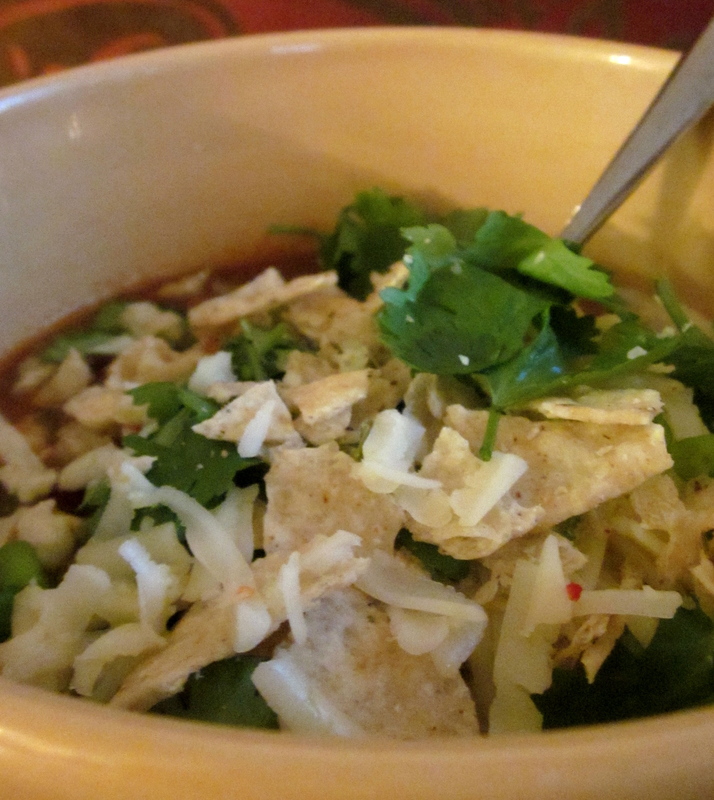 There are a lot of good Americanized Mexican soups out there, but so far this one is my favorite. You have to try this recipe. Maybe before you call child protective services. Drain and rinse the beans. 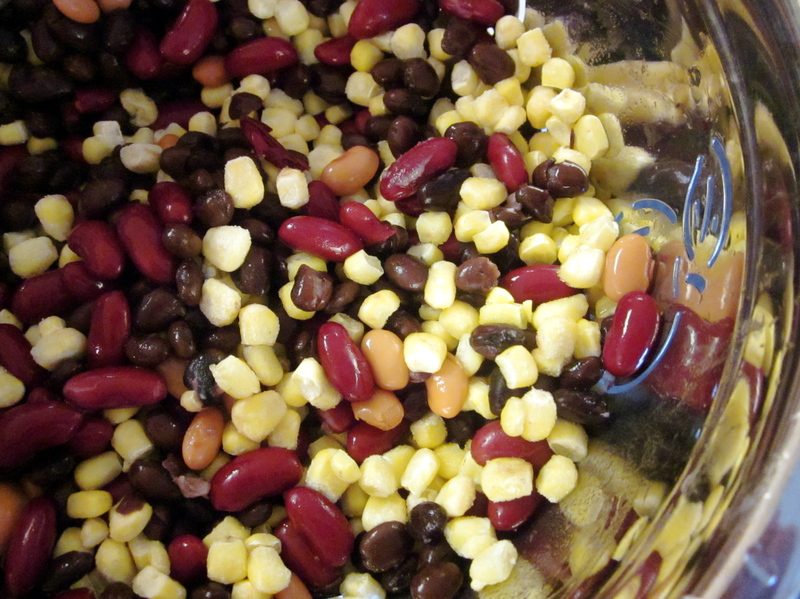 Place the onion, beans, corn, tomato sauce, and diced tomatoes in a slow cooker. Add spices, and stir to blend. Lay chicken breasts on top of the mixture, pressing down slightly until just covered by the other ingredients. Set slow cooker for low heat, cover, and cook for 5 hours. Remove chicken breasts from the soup, allow to cool long enough to be handled, and shred or chop. Stir the chicken back into the soup, and continue cooking for 2 hours. Serve topped with shredded cheddar cheese (or pepper jack if you like a little more heat), a dollop of sour cream, a few squirts of lime juice, chopped cilantro, and crushed tortilla chips.